I forced myself to get these photos taken though because I'm so happy with the small changes I made to our son's bathroom. I've been pulling things together for this new look for a year or so, and just needed to paint the room. I forgot what a pain it is to paint a bathroom! I took all the fixtures down (except for the light), filled holes and had a ton of cutting in to do. 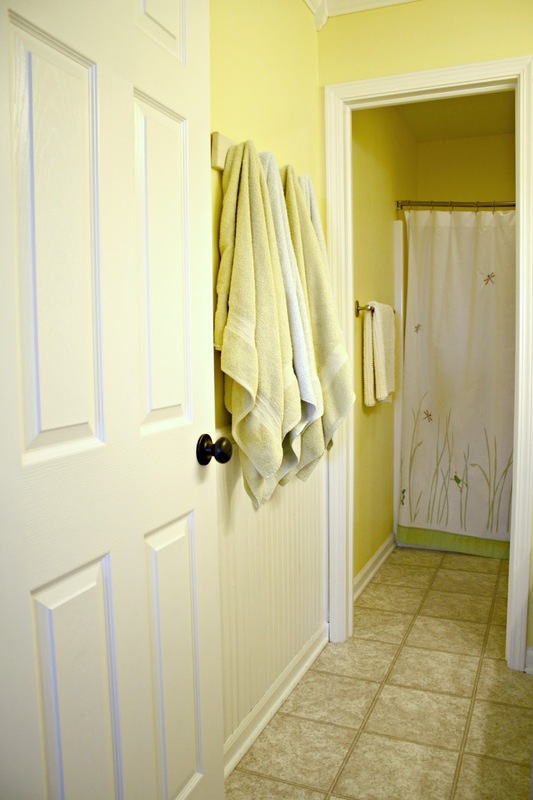 A bathroom has a lot more cutting in in general with the tub and toilet and counters. It took two coats of paint to cover the old yellow too, so what I thought would take me an afternoon took nearly a week. Isn't that always the way? I actually started painting it white a couple years ago, thinking I wanted to go that direction. I soon realized I didn't so I stopped. 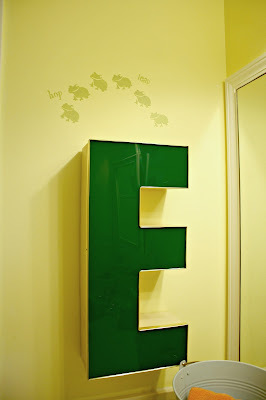 But that wall with the "E" was white while the rest was yellow. This is why I've wanted to knock this off my list -- I told you earlier this year that I am tired of unfinished projects and I'm tackling them one by one. Because I do want to give this room a bigger update next year, I didn't want to spend much now. I used the leftover Whitestone paint from our bedroom and it such a pretty gray color. It goes a little more blue in here, which I love with the navy accents. The towels worked great out there when he was a baby and was being bathed in the little tub, and then later it was still fine because I was always there as he took a bath. Now that he takes showers (sniff) the towels needed to be closer to the tub. So cute! 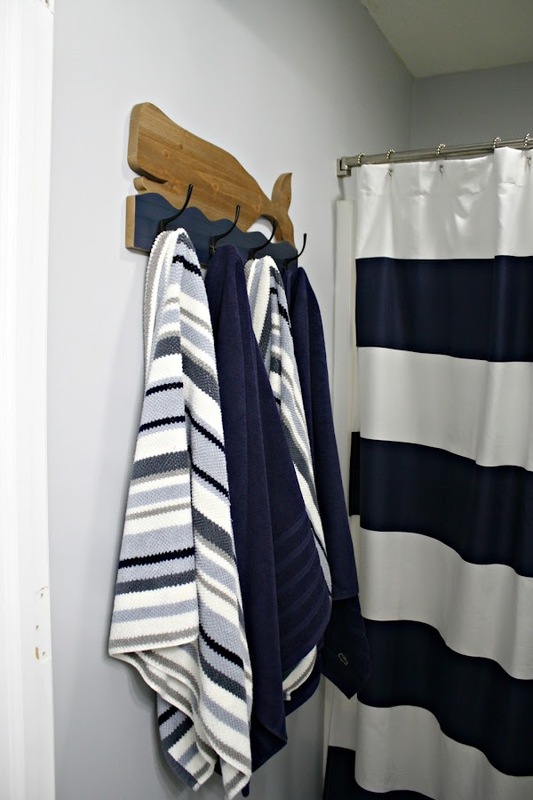 The towels were all from HomeGoods -- the striped we've had and I picked up the navy a couple weeks ago. You may notice there used to be a door there -- years ago I went through the house and took down a ton of doors that were taking up precious space. I haven't covered up the trim because this whole wall will probably come down next year. They have a shape that leans nautical and the size and bright white looks so much better. You should be able to do the same with a similar bathroom light -- there's a little round brace inside that you turn. It holds the glass in the fixture. Funny how I didn't care for that light before and now it's pretty perfect in this room! The back room with the shower got new paint as well, but this paint was a slightly different color. I ran out of the Whitestone (not realizing I'd have to do two coats) and when I went looking through the paint stash I found that the Pebble Beach color I used in the laundry room was nearly identical. I like grays, what can I say. :) They are the perfect neutral! The accessories are mostly items I've picked up at Goodwill and have had forever for this space. I added some driftwood to a Ball jar and an IKEA lantern as well. My only (recent) cost for this makeover was the new glass for the lights and a new shower liner that you can't see. 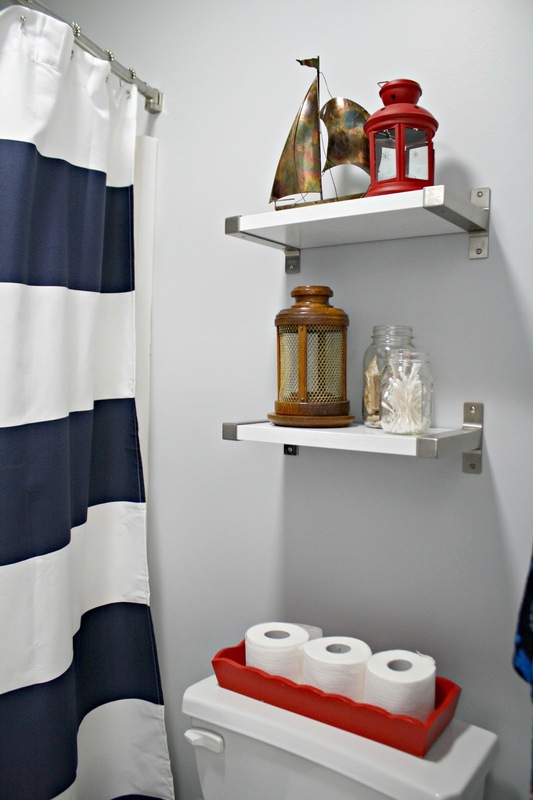 I mentioned I've picked up items for this space over the years, but even with the new shower curtain, hooks and the recent purchases, this redo still came in well under $100. He's nine now (sniff!) so I wanted to keep it fun but make it a little more sophisticated. I considered painting the cabinets and adding more beadboard, but with a plan in place to update this room, I didn't want to spend anymore than I needed. The accessories will still work when those changes are made down the line. I think the difference is pretty substantial when the biggest change was paint! I am really thrilled with this room and it will definitely hold me over till we make the bigger changes. It feels so fresh now! Absolutely love it! Wonderful transformation - what a beautiful space. I agree the vinyl floors look so much better with the new wall color - who would have thought? WOW. 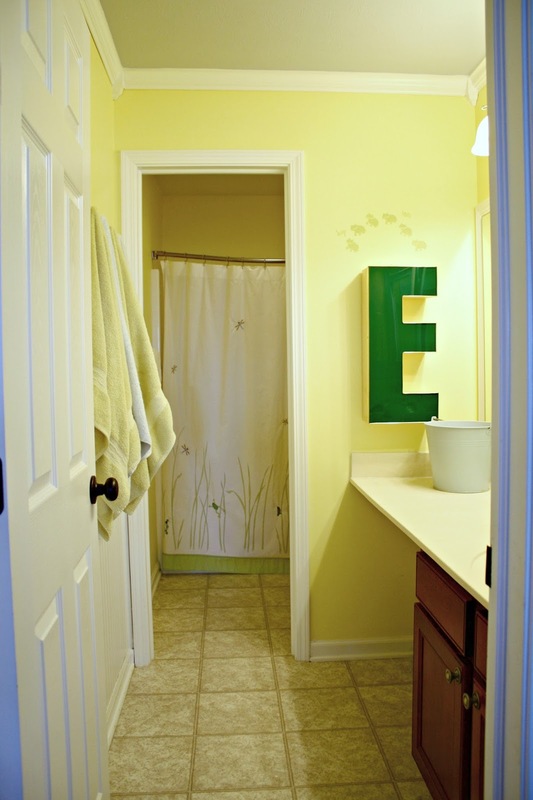 Crazy how just a few simple changes transform the whole bathroom. I'm in the process of buying my first home, and it's hard to see the potential sometimes. Thanks for all your tips! This looks great! Very clean, very bright and fun! Seriously? Is that even the same room? . 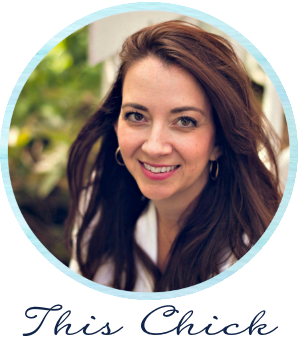 Fabulous updates! Aren't you proud of yourself when it's done? I love it! Looks amazing. Love the changes. I feel your pain, I just got over a really crappy cold that took forever to go away!! Love, love, love the power of paint! Looks great!! I love this - I think you have inspired my next project! 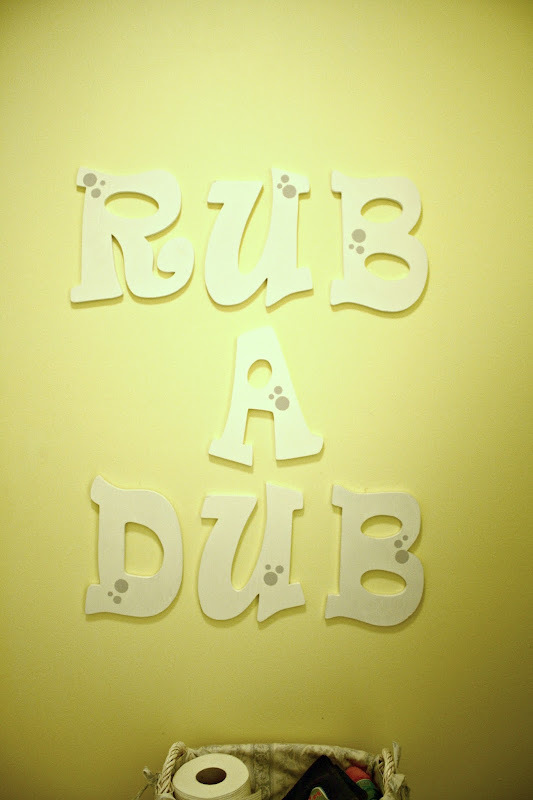 I have always wanted to make a sign for my boys' bathroom that says, "Pee, Flush, Wash."
Did you paint the ceiling as well? It looks like it has a tint of blue. Paint sure does make a difference. I love it! It looks fantastic and what a difference to those lights? I'm doing our bathroom just now. 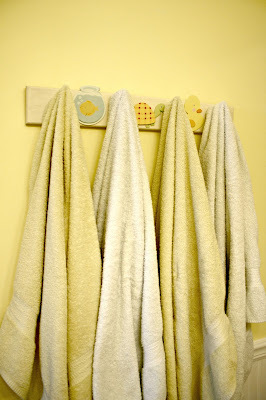 We've always had towel rails but I'm seeing more and more hooks. 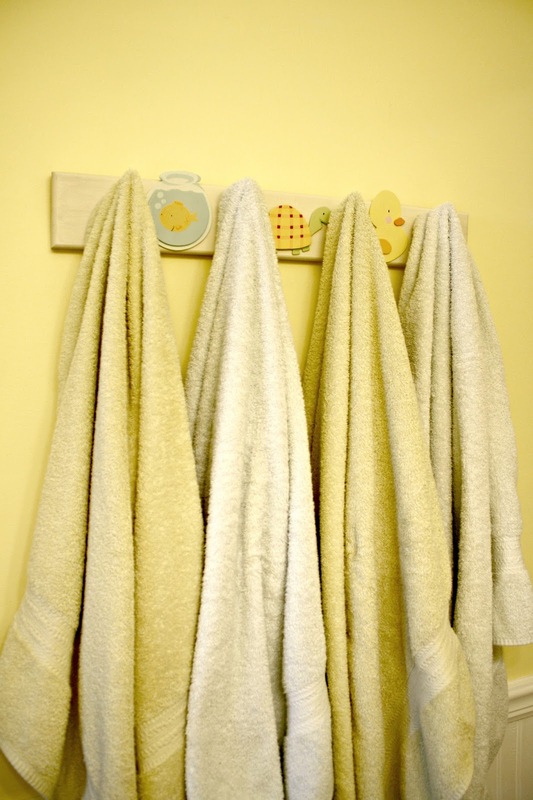 Do the towels dry off ok when hung like this or do you have to replace them after every use? 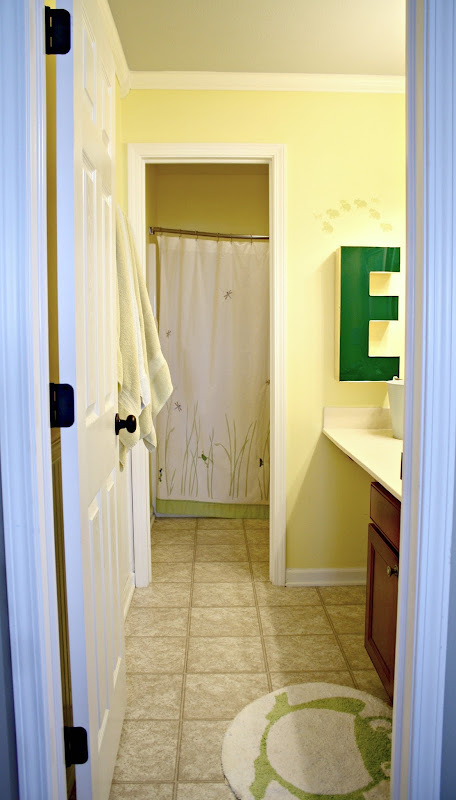 The power of paint and a few tweaks of accessories and a whole new bathroom. Lovely! LOVE IT, Sarah! For me, one of the biggest differences is how the grey paint affected the look/color of your countertop!!!! The old, yellow color made it look dingy (sorry!) --it seriously looks like new countertop to me-brighter and lighter!! Great job. Painted a bathroom today. 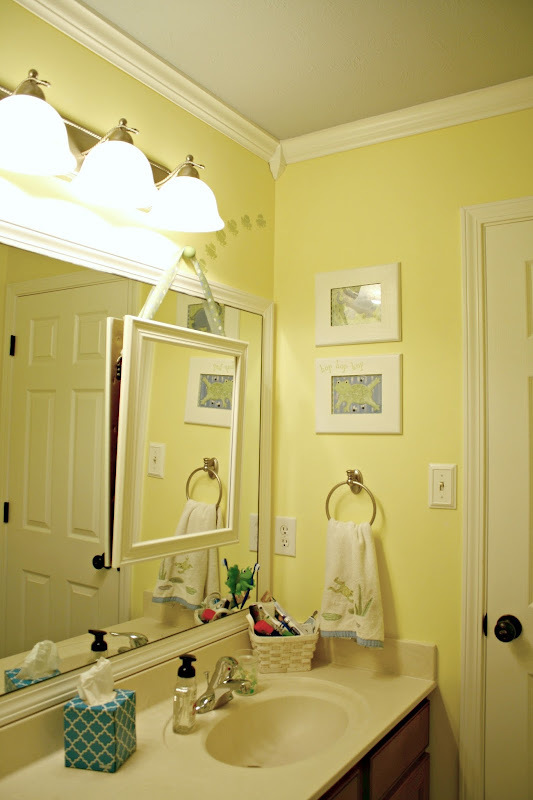 The cutting in is so challenging in bathrooms, and we have that "lovely" orange peel texture on everything that makes getting crisp lines between walls and ceiling almost impossible. But, I'm really happy with the changes so far and can't wait for it to dry enough to put the decor back up! Looks great! The power of paint never ceases to amaze me. Sarah I hate to sound like an Old Mother Hubbard, although I am old and I am a mother, anyway. Do NOT use anything with menthol - no cough drops, no medicine, no NOTHING. My Ear, Nose and Throat doctor told me stop when I was coughing so much and once I stopped, I stopped coughing. Use Hall's Breezers, Ricola or even a hard candy. Menthol makes mucus. Hope you feel better soon. Thank you! Nothing much has even touched the cough this week so I've just been on prescription cough medicine. Thankfully it's almost gone! As always, it looks so nice, especially for a project that you will be redoing in a few short years! I really love the difference that the new light covers make! Great job Sarah! Now I hope you rest and feel better soon! Everything looks so fresh & bright!! I love the framed wall art !!!! Feel better ASAP!! Happy Thursday friend! Paint is so amazing. I love that color. I remember you mentioning wanting to take down the wall in the future and building a new vanity. 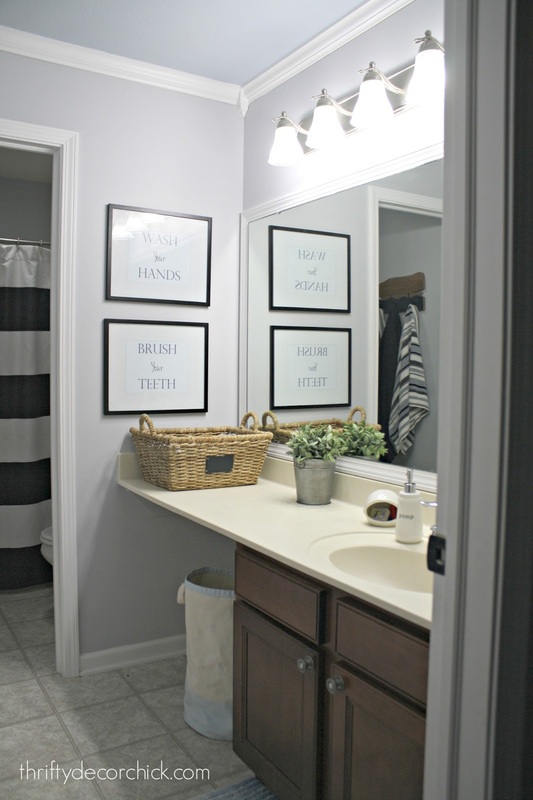 If you wanted to save money and still have the open concept of the vanity you showed previously, maybe you could keep your existing one and add opening shelving to the other end of it after you take the wall down. Add trim to the front of the whole vanity to make it look like one piece. Maybe paint the whole thing a gray weathered color?? Where did you find the light covers for $7 each? Only ones I can find are like $20 a piece. Great job! You are right that the new paint looks so much better! It really updates the room. The floor looks "newer" now, too! Such a dranatic change for not a lot of money! I love your posts and always look forward to them! Have a great day! I'm so inspired. 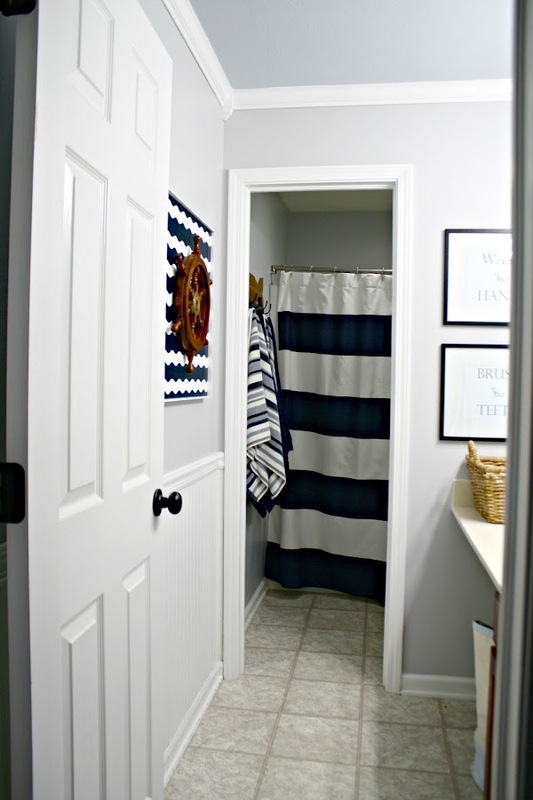 I have the same shower curtain and have been wanting to redo my boys bathroom. The paint makes such a difference as well as lighting. I also want to know what paint color you used for the ceiling. 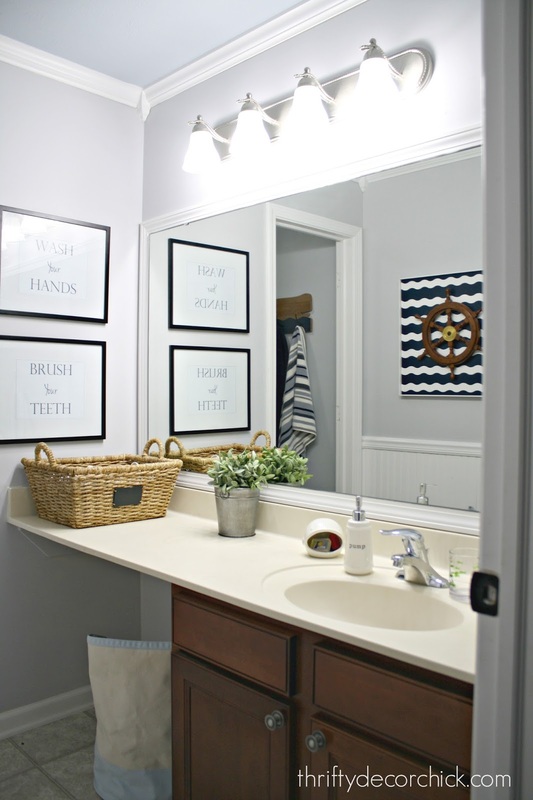 I have white cabinets in my bathroom and was thinking to paint them a darker grey. Thank you for sharing. Quite the transformation, looks great! Feel better! The paint and change of the covers on the light fixture makes it look like a whole different room! Thanks for showing us how much you can achieve with a small budget. Hope you feel better soon! 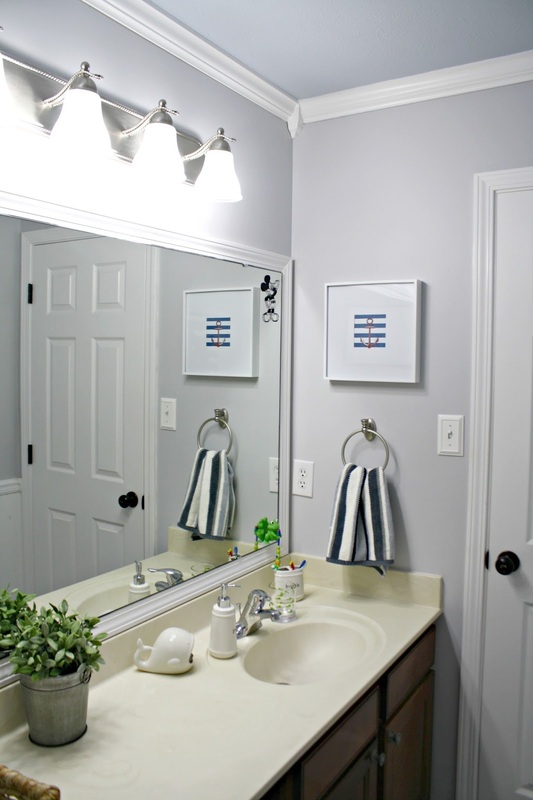 I just did my 9 and 14 year old boys bathroom, from a wallpapered beige (former 2006 model home) to white and grey. 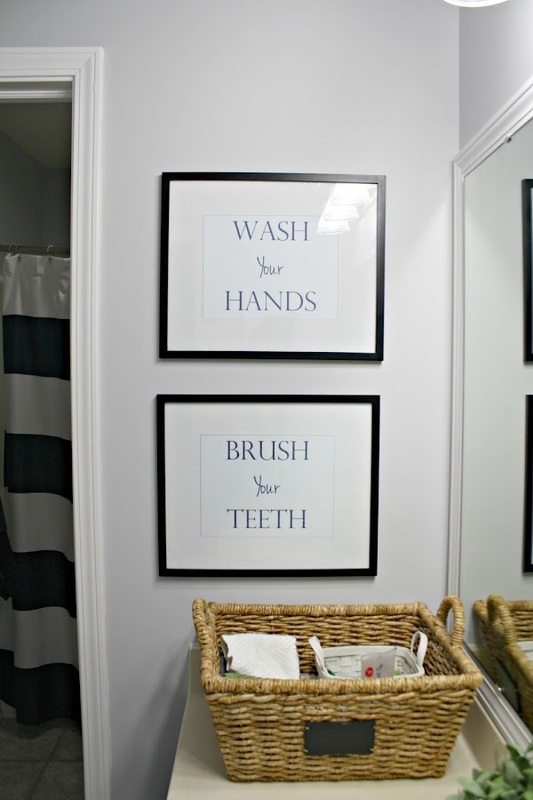 Add a star wars shower curtain and some themed art in simple frames and they are enamored, and I can change it to anything else in the future at minimal cost. Off to do the next room. This is such an amazing transformation! You did an incredible job! That looks so much better. Well done! I hope you feel better soon. PS. 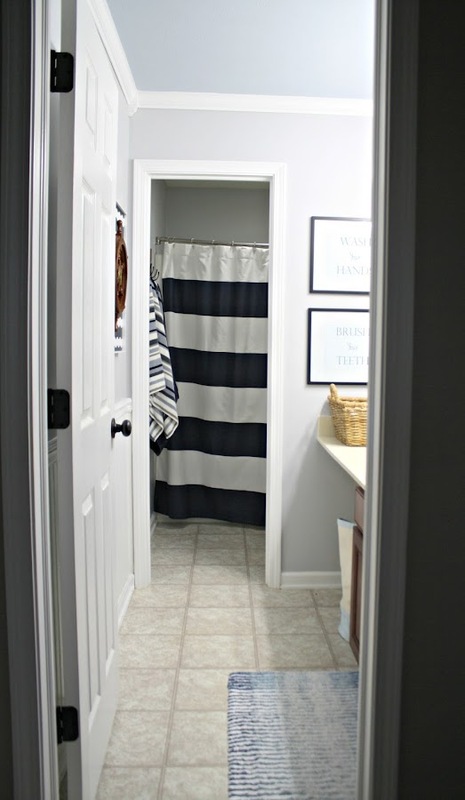 Did you consider painting the cabinets in the darker gray which you used in the shower room? Maybe it's not worth the effort, for such a short time, and they look fine as is as well. I got something Martin Luther King weekend that turned out to be a cold with a horrible cough. It took me until last week to feel like I was finally over it. I'd feel OK for a few days and then not. Hope it doesn't hang on that long for you! Wow, I'm inspired by changing out the light shades. I don't think I realized how much of a difference that would make. I hope you feel better soon; crazy how you got slammed with it. Fabulous makeover! Love the grey & Navy. 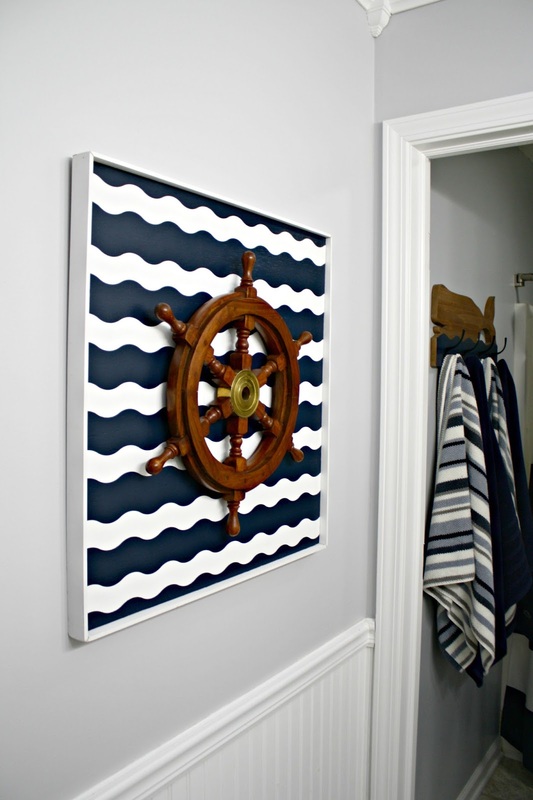 I recently did the same color scheme for a nine-yr-old boy's room, & it came out great. I think one reason the floors look so much better is because while they are muted/warm/dirty, the yellow paint was clear/pure/clean. Mixing the two always makes the muted colors look "dirty." May I ask where the shower curtain is from?